Following the nitro engine tuning tips outlined on this page will not only extend the life of your engine, but they will solve most of your problems getting your engine to run correctly. Your engine giving you fits? Let us help you get'er straightened out! Anyone who's ever messed with a glow engine can tell you that these little guys are finicky to say the least. It's absolutely no fun when you've tried everything you could possibly imagine and she just won't run right. I've been there an done that. If your engine is still giving you fits after you've exhausted all the tips on this page, feel fry to explain your problem here and maybe we can help you get'er straightened out. Before getting into specific nitro engine tuning tips, it's important for you to understand why it is so critical that your nitro rc engine be tuned correctly. An automobile engine has a radiator and water pump. The water is pumped through the engine block to remove heat from the engine. The water then goes through a radiator (heat exchanger) where a fan passes air through the radiator to cool the water. Unlike a glow engine, they also have a lubrication system. The oil is pumped from the oil pan to the engine to lubricate all of the working parts. The lubrication greatly reduces heat and wear from friction. Without either the cooling or lubrication system the engine would very quickly become so hot that the internal parts would literally begin to melt, ruining the engine. The single most important nitro engine tuning tip I can give you is to avoid running your engine lean! 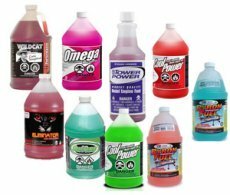 It is just as critical for a glow engine to have adequate lubrication and cooling as it is for an automobile engine. Some of the heat from a nitro-powered engine is removed by air from the propeller moving across the fins on the engine's head. However, this is not nearly enough cooling to keep the engine from overheating. For this reason the fuel in a glow engine acts as a coolant to remove the heat from the engine. All glow fuels have a certain content of oil which lubricates the parts. By adjusting the high-speed needle valve you are controlling how much coolant and lubrication the engine is getting. Running an engine too lean will destroy your engine just a quickly as driving your car without oil or with a busted radiator hose. It is vitally important that you NEVER under any circumstances run your engine lean. The engine should be adjusted slightly rich at all times. Keep in mind that the nitro engine tuning tips provided here are only guidelines for tuning your engine. Please read and follow the directions that came with your engine for adjusting the carburetor. Every nitro-powered engine has both a high-speed needle valve and a low-speed needle valve. The high-speed needle valve controls the amount of fuel that enters the carburetor when the engine is running fast. The low-speed needle valve controls the amount of fuel entering the carburetor when the engine is at idle. You always want to set the high-speed needle valve first because the low-speed needle valve position will be dependent on where the high-speed needle is set. A very important nitro engine tuning tip is to make sure you learn to tell when your engine is getting too much fuel (too rich) or when it is not getting enough fuel (too lean). A needle valve consists of a tapered "needle" that seats against a tapered journal. Needle valves are used where very fine control of flow rates is necessary. Some nitro powered engines have the high speed needle valve mounted right to the carburetor. 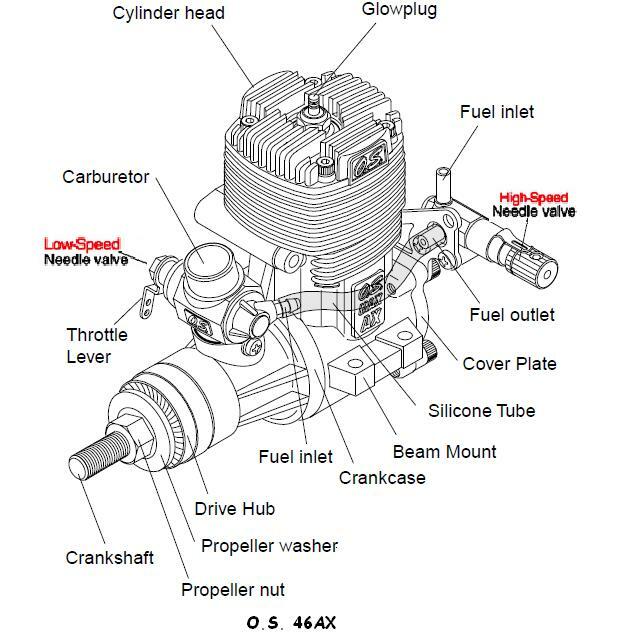 This is dangerous because you have to adjust the engine while it is running, and the carburetor is darn close to the propeller. Most nitro engines have the high speed valve mounted behind the engine and is connected to the carburetor by a length of silicon fuel tubing. You can see this on the diagram above of the O.S. 46 AX engine. 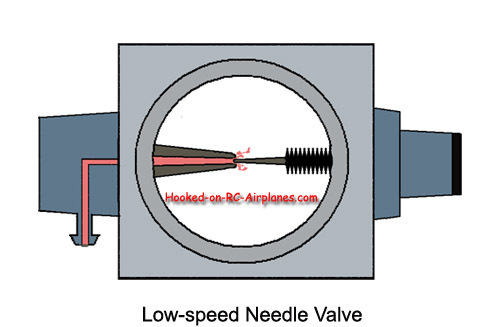 Setting the high-speed needle valve is fairly simple. Run the engine at full throttle and observe how it reacts. If it is stumbling, not firing consistently, or producing excessive smoke then it is running too rich. As you close the high-speed needle valve, the engine will begin to run smoother and the RPMs will rise. The engine will continue to speed up as you close the needle valve until you pass the optimal fuel setting. At this point the engine will begin to slow down as you decrease the fuel going to the engine as it is now too lean. When this happens, immediately open the needle valve a couple of clicks! If you run the engine at a lean setting for more than a few seconds it will damage your engine. The pinch test is probably one of the best nitro engine tuning tips than I can offer. When the engine is at full throttle, simply pinch the fuel line feeding the carburetor for a brief second. It's best to pinch the fuel line that connects the carburetor to the high-speed needle valve. This would be the line labeled "Silicone Tube" in the above drawing. If you pinch the fuel line before the high speed needle it will take the engine longer to react. If the engine is running rich, the RPMs will increase slightly before the engine sags. If the engine is lean, the RPMs will immediately decrease. The high-speed needle valve should always be slightly rich. Slightly rich is good for your engine. Slightly lean will destroy your engine! The engine will lean out while flying your airplane due to the emptying of the fuel tank. You will need to compensate for this by setting the engine slightly rich on the ground. If in doubt, always err on the side of being too rich. Your engine will last longer and there will be less of a chance of your engine stopping in mid flight. I hope these nitro engine tuning tips help you get the most out of your engine. If you're still having problems after following these tips, by all means explain your problem below so we can help you get off the bench and into the air! Because the tone of a 4-stroke is so much lower than a 2-stroke, it is very difficult to tune the engine by listing to the engine speed. A tachometer is a necessity for tuning a 4stroke engine. This leads to my next nitro engine tuning tip. If you have a four-stroke, buy a tachometer! Adjusting your engine without a tachometer is very difficult and you take the chance of running your engine lean and ruining it. Investing in a good tachometer will extend the life of your engine by allowing you to properly adjust the fuel settings. Setting the high-speed needle for a 4-stroke is basically the same as it is for a 2-stroke. The only difference is that you watch the tachometer as you adjust the needles instead of listening to the engine. Starting with a definite rich setting, slowly close the needle valve and watch the RPMs rise. Watch for the peak at which the engine stops speeding up and begins to slow down. Note what the tachometer indicates at this point, then open the needle valve slowly until the RPMs are about 200 less than the peak rpm. This will set the engine slightly rich. Another nitro engine tuning tip is to hold the airplane vertically with the nose up and run the engine at full throttle. Be very careful while holding on to the airplane tightly. It is best if you can have a friend hold the airplane while you operate the transmitter, or vice versa. If the engine runs steady or slightly increases in rpm as you raise your airplane to the vertical position, you are in good shape. If the engine slows down at all then the setting is too lean so you need to open the high-speed needle a little bit and try again. Repeat this process until the engine runs steady with no sagging for at least 30 seconds at full throttle while holding it vertically. After you are satisfied with the setting of the high-speed needle, it is time to adjust the low-speed needle valve. This valve not only controls the fuel/air mixture when the engine is idling, but also controls the fuel/air mixture as the engine transitions from idle to full throttle. It can sometimes be a little frustrating to get this setting just right so that the engine transitions smoothly from idle to full throttle without sputtering or dying. The low-speed and high-speed needle valves work in conjunction with one another. When you adjust the low-speed needle valve it may be necessary to re-adjust the high-speed needle valve. Then of course, you may need to readjust the low-speed needle valve again. It is not difficult, but it does require some patience. 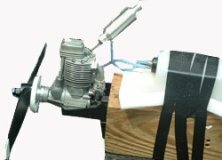 Most nitro engines have a needle valve for adjusting the idle, but there are a few that use an air bleed screw on the carburetor. It is important to know which one you have because turning in a needle valve leans the mixture while turning in an air bleed screw causes the engine to pull in more fuel making it run more rich. Low-speed needle valves are very touchy. You only have to move them a hair to make a huge difference. Most engines today have a low-speed needle valve. This is a little different than the high speed needle valve. 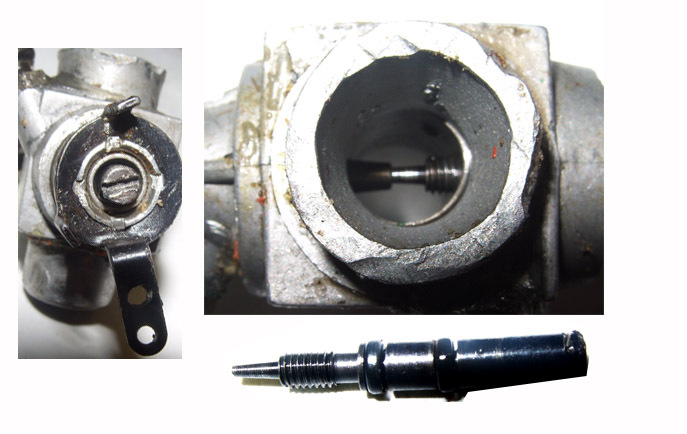 The low speed needle valve is locate in the carburetor. This entire assembly seen in the picture above is commonly referred to as a "spray bar". Above are some pictures of the spray bar assembly in an engine from my graveyard. Please excuse the condition of this carburetor, this engine has been buried in the dirt a couple of times. But this give you an idea of what the low-speed needle consists of. Once your engine is warmed up, bring it to an idle. A lot of people want the engine to idle as slowly as possible, especially with 4-strokes because it sounds cool. But it is smarter to adjust the throttle linkage and throttle trim so that the engine idles as fast as you can get it without having enough thrust to pull the airplane forward while on the ground. When you are satisfied with the idle speed punch it to full throttle all at once. If the engine dies quickly the mixture is too lean so you need to slightly turn out the needle valve and try again. If the engine sputters, coughs, and slowly dies then it is too rich and you need to very slightly turn the slow-speed needle in and try again. Please follow this important nitro engine tuning tip of turning the slow-speed needle valve only a tiny amount each time. It will save you much time and frustration. Once you have achieved a smooth transition from idle to full throttle, you need to double check the high-speed setting again. If it is still good then you are ready to go flying! Sometimes adjusting the low-speed idle can mess up the high-speed setting. You may have to adjust the high-speed again. If this is the case, you also need to check/re-adjust the low-speed after re-adjusting the high-speed. Many times you can get it pretty close the first go around. But sometime engines can be stubborn and you have to keep fiddling with both the high-speed and low-speed together until you are happy with it. We've all had those days when our engines give us fits! We know how frustrating it is to spend more time tinkering with the engine than actually flying! And those dead stick landings get old fast! If your engine is giving you fits, we'll get to the bottom of it one way or another! This is also the place to share the solutions to problems that have may plagued you in the past so that others may benefit! You may find your answer by checking out what others have already asked. If you have a picture to add, this is where to do it. Click the button and find it on your computer. Then select it. Click below to see some of the problems, solutions, and general nitro engine tuning tips from other visitors. Os52 reluctant to start, rpm drops then quits. OS 25 Starts Up Nicely then dies and will not start again. I have been having a few starting and running issues with my OS 55 AX. Today it spat out three Glow plugs. Does anyone know why? I screwed up factory low speed needle setting. Can anyone tell me at what point to set the screw to begin trying to set the low end? In flight, engine dies when set back to idle? After following the tuning tips in this article , the OS 75 AX still quits on T/O or after a short time in the air. Any suggestions?